Iran's President Hassan Rouhani attends a ceremony for the production start of new Iran Khodro products, the Dena+ and Peugeot 2008. PARIS -- French carmakers PSA Group and Renault are turning their U.S. absence into an advantage in Iran by piling into a resurgent market still off-limits to foreign rivals fearful of sanctions under Donald Trump's administration. The French investment has been seized upon by Iranian President Hassan Rouhani, who is seeking re-election this week, as evidence that his pursuit of a nuclear detente and attempts to attract foreign money will pay off for the economy. PSA - the maker of Peugeots and Citroens - and Renault have pushed hard into Iran since its 2015 deal with world powers that saw international sanctions lifted in return for curbs on Tehran's nuclear activities. PSA has signed production deals worth 700 million euros ($768 million), while Renault has announced a new plant investment to increase its production capacity to 350,000 vehicles a year. The French companies, unlike their German, American and Japanese competitors, do not have manufacturing or sales operations in the United States. This makes them less vulnerable to penalties for any violation of U.S. sanctions still in force which ban financial transactions with Iran. The prospect of a hardened U.S. stance under President Trump - a consistent critic of the nuclear deal - has deepened the caution of carmakers with large American exposures. Germany's Volkswagen and BMW are among those that have put Iranian ambitions on hold, industry sources told Reuters. "We are well aware of the market potential in Iran but we can't afford to take any risks," said a source close to VW. The company declined to comment on specific investment discussions. PSA and Renault declined to comment on their Iranian operations in detail. Earlier this year, PSA's Middle East chief Jean-Christophe Quemard acknowledged that the renewed U.S. pressure under Trump was helping his company stay ahead of foreign rivals who were holding back. "This is our opportunity to accelerate," Quemard said. "We have opened up a lead and we plan to hold on to it." Early movers to establish Iranian operations could win big in a market deprived for years of affordable state-of-the-art vehicles and where sizeable import duties hand a major advantage to locally built cars. Iranian car sales jumped 50 percent in the first quarter of 2017, according to data provider IHS Automotive, with models from Peugeot, Renault and Iran's SAIPA showing solid gains. Tehran car salesman Mehdi Monfared, whose dealership mostly sells domestic manufacturer Iran Khodro's namesake brand, said he had witnessed an "explosion" in demand in recent months. "People are being less careful with their money and are spending their savings on cars," he told Reuters by telephone. "And the banks are lending." 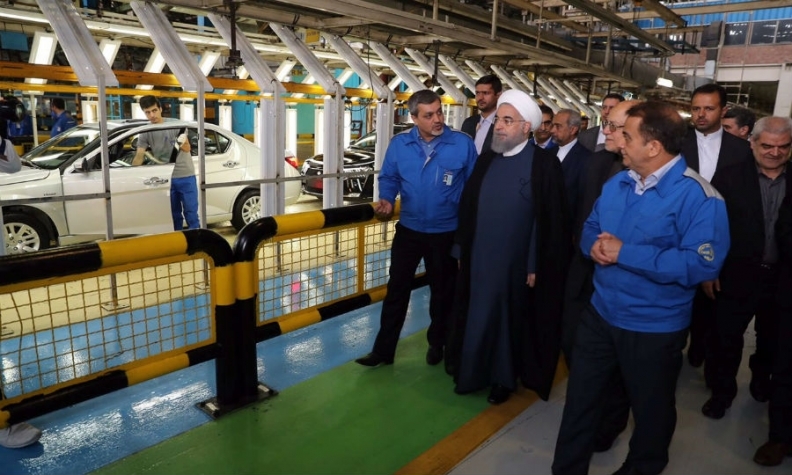 Rouhani pushed the French investment to the forefront of his election campaign when he attended a ceremony this month to mark the production launch of the Peugeot 2008, the first product of post-sanctions manufacturing deals with foreign carmakers. "When we signed the nuclear deal, critics said it was just a piece of paper that would never be implemented," the president, whose main challenger is a hardline cleric opposed to opening up Iranian markets, said in an Instagram post picturing him behind the wheel of the mini-SUV at the event in Tehran. "But now we can see that auto industry sanctions have been lifted, joint venture agreements concluded and a new car is being built." PSA and Renault have moved swiftly to sign new production deals to upgrade their pre-sanctions partnerships with Iran Khodro and SAIPA. PSA plans to add more Peugeot and Citroen models in coming months, while Renault has introduced its Sandero subcompact hatchback alongside the Tondar sedan. By contrast VW, which had been considering a production tie-up with Iran's Mammut Khodro, has put the talks on the backburner because of the uncertainty, according to the source close to the group. "Any company operating in Iran or planning to enter the market needs to ask itself what could happen if there is a fundamental change of course by the U.S.," the person said. BMW has also studied production, import and distribution opportunities in Iran but concluded that the time was not right, according to a source familiar with the matter. "Once we see General Motors and Ford set up shop our plans may be revived, but not before," the person said. A BMW spokesman said the company's future entry into Iran "will depend on political and economic developments," adding: "There are currently no concrete plans." Daimler had announced undated plans for Iranian heavy truck production before Trump's November election victory, but now plays them down. "There is hardly any economic growth in Iran, so demand for commercial vehicles is generally low," the company said. U.S. carmakers withdrew before the 1979 Iranian revolution as ties between the countries broke down. Japanese manufacturers such as Toyota have not signaled any Iranian investment plans since the nuclear deal. Nuclear-related sanctions were lifted after the 2015 agreement, but Washington has maintained its own pre-existing ban on financial transactions with Iran, making it harder for companies with a large U.S. presence to do business with Tehran. The Trump administration has also ordered a review of sanctions relief granted under the nuclear deal, despite acknowledging Tehran's compliance. But the U.S. pressure has not halted a steady recovery in car production in Iran, from 796,000 cars in 2013 to 1.23 million last year. IHS expects output to keep climbing to 1.34 million cars this year and 1.49 million in 2018, nearing the 1.65 million peak recorded in 2011. "Locally built vehicles are the bestsellers by some margin," said IHS analyst Michel Jacinto, an Iran specialist. South Korea's Hyundai is building its Accent compact, to be followed by the i20 mini, as Chinese brands including Chery move to defend the small but growing footholds they gained while sanctions kept their European rivals out. Affordability may be an issue for some new models. The Peugeot 2008 is expected to be priced at around $24,000 when it arrives in showrooms - more than three times the average annual urban household income in Iran. Until such market realities are tested, however, the new products are being greeted with optimism. "The 2008 launch is the result of Rouhani's policy since the signing of the nuclear deal, so it was symbolic," PSA's Quemard told Reuters last week. Project lead times of two years or more mean the 2008 is the international agreement's first tangible result, Quemard said. "So it's a good example - and it's being used as such."